What are the benefits of assisted living? Is Assisted Living at Heron Manor affordable? 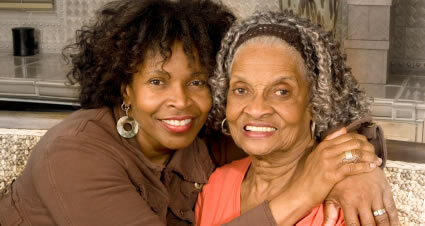 What are the benefits of assisted living? 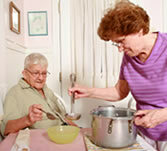 Proper Nutrition: One of the risks for seniors living alone is to neglect balanced meals and proper hydration. For some seniors, cooking meals for one is often troublesome and wasteful so they cut corners, make less nutritious choices, or simply neglect eating well. At Heron Manor, residents are provided three meals a day in the lively and social dining room. Meals are chef-prepared and cooked from scratch, not typical frozen food service fare. The delight of the kitchen staff is to serve food that excites residents while ensuring proper nutrition. Active Minds/Active Bodies: Living alone is isolating and lonely. 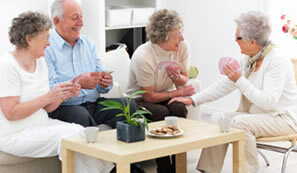 At Heron Manor, residents enjoy the company of others to ensure their connectedness. Together, residents enjoy numerous social, recreational and educational opportunities to enrich their lives. Scheduled outings, guest speakers, on-campus religious services, etc. contribute to a well-rounded life at Heron Manor. Freedom from drudgery, not responsibility: No one, at any age, wants to have all responsibility removed from their life. Responsibility gives our lives meaning, and creates a sense of accomplishment and purpose. At Heron Manor, residents are given opportunities to conduct their weekly shopping, banking, and to meet their own other practical needs. Transportation is provided. Some residents like to prepare a few of their meals in their own kitchens throughout the week. Participating in community life, and meeting each other’s needs, creates opportunities for residents to accept responsibility for each other and reinforces a positive sense of purpose. Socializing within reach: For some residents, it begins with the beauty parlor. Our professionally designed and managed Heron Manor Salon is located on site. Here, neighbors gather to get beautiful, and catch up on each other’s lives. A few short steps away is a bustling game room. And of course, the dining room is the town square for three square meals a day. When friends are in reach, its amazing how much more time we spend together. Piece of mind: Heron Manor residents are safe and secure in this barrier- free, modern living facility. Professional staff and caregivers are able to meet the unique physical, social, and emotional needs of residents. The availability of health care on premises, as well as a broad range of supportive services means that residents feel safe and comfortable. And if their needs change, residents can elect to receive additional services for as long as they need to. The goal is to help residents enjoy a wonderful quality of life, to create a living environment that dignifies them, and to prolong their independence.